Cherry tomatoes, grown in Italy and hand picked when perfectly ripe. The delicate cherry tomato is then sliced in half and semi dried. We then pack our Dorati in olive and sunflower oil, and fresh basil. Preserved without vinegar or sulfites, this elegant cherry tomato is perfect for chilled starters, flatbreads, sautes, fish dishes or any center plate entrees. 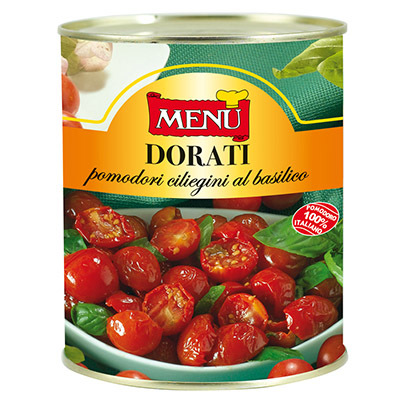 Mild and delicate, Dorati is perfect when combined with herbs, olives or utilized across tomato enhanced recipes.